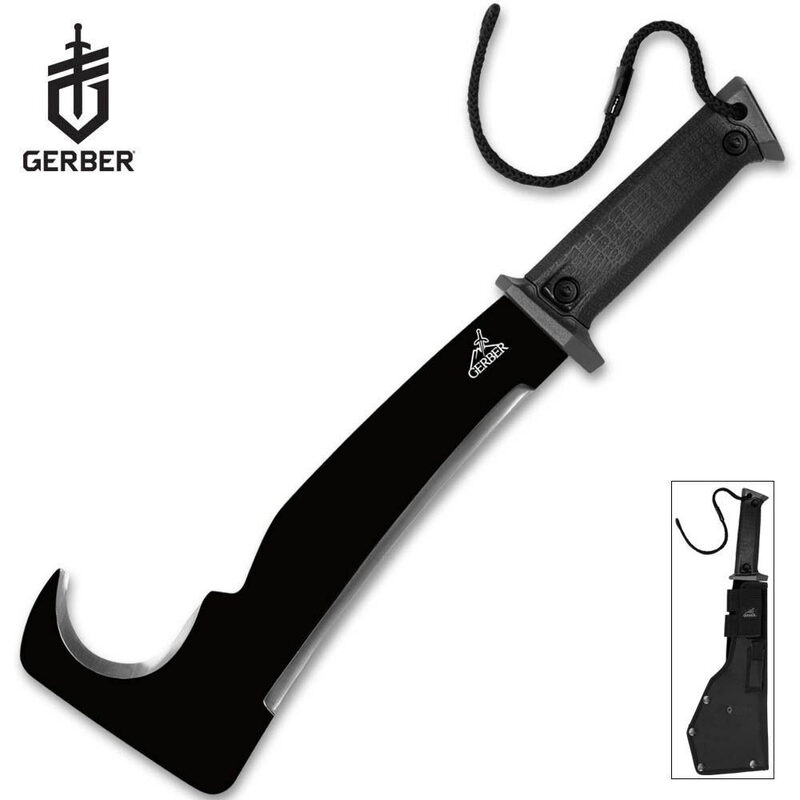 Gerber Gator Machete Pro | BUDK.com - Knives & Swords At The Lowest Prices! Whoa! Just whoa! I am blown away by the quality of this machete. Unlike many of my blade hobby purchases, this machete has come in extremely useful over, and over again. It is a great tool. I take it to work in Estes Park, Colorado, and use it to limb, and cut down trees between 2.5 and 3.5 inches in diameter. I'm sure it could hack through thicker trunks; but those are the ones I'm supposed to cut down. Don't worry tree-huggers, all the trees are already dead. I bought this and this blade was already sharp enough to take a hand off in once swipe love it, very sturdy and the grip on the handle and the tie for your wrist is a perfect combo to stay in your hand, and the sheath is top notch Great for a zombie killing weapon. THIS IS A AWSOME AXE AND SHEATH CUTS THRU TREES AND BRUSH EASILY GREAT WAY TO WORK OUT YOUR ARMS ITS WORTH IT ALSO HAVE GATOR PRO JR. ITS A NICE MATCHED SET SAW BACK ON IT IS GREAT. This machete is so nice! Can't wait to use it. This machete is incredible! It arrived fairly sharp with no scratches or flaws. The case is also very well made and it covers the machete like a glove. I haven't had a chance to actually use it (yet alone on some zombies), but so far it seems like a reliable knife to use. Forty dollars is a little steep for me, but I had to have it after watching "The Walking Dead"! This weapon is sweet! This machete is truly one of a kind. I'm a huge fan of The Walking Dead show and once i saw the machete i knew i had to have it. I ordered it off this site because of the good price. It was shipped extremely quick and once I opened the box up I saw the quality first hand.. Great knife and it's super steady. The gator grip and very grippy and that nylon lanyard is a great help. The sheath is very well constructed and the sharpening stone is a great plus. Great buy! As a Georgia native and a Atlanta resident when I first saw this machete i knew that I had to buy one to help in my day to day zombie encounters, but was surprised when my girlfriend wanted one too. So I ordered 2, they were shipped and arrived incredibly quick. Once I opened up the packages I quickly noticed how it was a nice solid piece all the way down to the handle. The no-slip grip is a great for complete control and handling. Blades both straight and curved came sharp as all hell and ready to hack away. Although i was hoping that the curved area was a little wider this machete is a must have for anyone.